If you are planning on building a pond, you will need to decide what materials to use, how to make sure that the pond holds water, and then what style the pond should be. All these factors will affect your project both in terms of cost and in terms of what skills and fish pond supplies you are going to need. Whichever option to decide on, you need to be sure that the pond will hold water without leaking. That might sound obvious, but many a pond project has failed due to leaks, some of which occur quite a while after completion of building work. For example animals (especially dogs) often jump into ponds and damage flexible liners. Some inferior-quality preformed ponds eventually become brittle and crack. 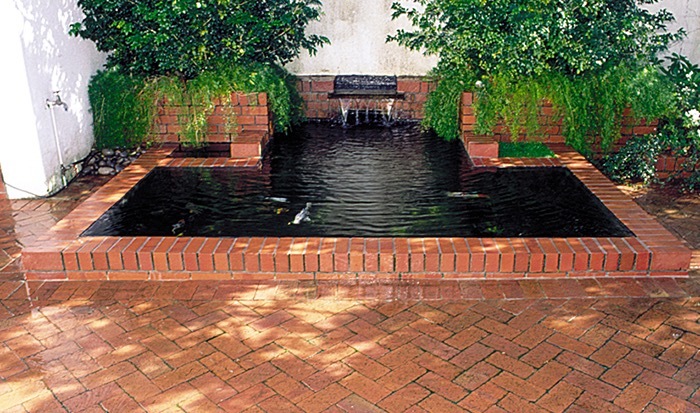 And ponds built with concrete, bricks or blocks and mortar, deteriorate and start to leak. So you need to be aware of these potential pitfalls before you decide exactly what to build and how to build it. In addition to the materials we can use to either build or install fish ponds, there are other waterproofing solutions that we can use to make sure our structures remain watertight over time. Here are some examples. In all instances you must be absolutely sure that materials are non-toxic, otherwise fish won’t survive. There are various materials that you can add to concrete, mortar and plaster mixes to make the finished surface less porous, plasticizers for example. The only problem is that they are not usually 100% successful on their own, so it is best to overcoat with some other material as well, like bitumen, a specialist waterproof paint, or with more expensive glass fiber. One of the most effective materials for sealing concrete and other plastered ponds, rubberized bitumen is simply painted onto the finished surface. It may also be used to seal ponds that are lined with geotextile materials. Just be sure to use a water-based product. Generally the first coat is diluted with water, and the more coats you apply to the surface, the more waterproof the finish will be, and the longer it will last. But you will need to follow the manufacturer’s instructions as these may differ. In the early days of swimming pools, concrete structures that were plastered and painted with specialist rubber-, epoxy-, vinyl-based or even acrylic paints were quite common. Some paint companies still manufacture these paints and they can be used with some success to seal plastered ponds. Be careful with colors, especially if you are aiming for a natural look. Dark hues give the most natural effects. This is another option for waterproofing plastered ponds. There are various products, and because they were developed for use in dams and to seal tanks used to store drinking water, they are non-toxic and generally resistant to chemicals. The most common products require you to coat the plastered surface with a special primer before applying the polyurethane. Again, be sure to follow the manufacturer’s instructions. Used to make preformed ponds, glass fiber may also be applied on site over smooth concrete and plaster to make sure surfaces really are watertight. It is ideal for sealing around boulders and both real and fake rocks that are used around the perimeter and inside of ponds. There are various methods of application, all of which involve a catalyst, resin and some sort of fiberglass matting. As always, follow the manufacturer’s instructions. Two-part epoxy putty may be used to plug small leaks or fill small holes or cracks. Silicone sealers are ideal for sealing around pipe-work, for example when you install a fountain in a pond. Just be sure to use a sealer that is manufactured for exterior use.